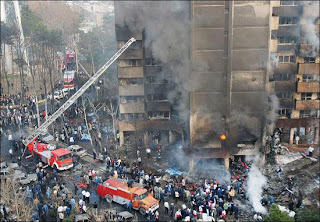 TEHERAN (Iran) - Military plane, carrying journalist, crashed into a Teherean apartment block and explode! At least 116 people died. 94 of them were passengers and crew in the C-130 plane. Twenty-eight people, some in critical condition, were taken to hospital. Several children, at home because schools were closed due to a smog alert in the capital, were among the dead in the building. "I was sitting at home when the windows suddenly smashed and flames came pouring in," a woman in her fifties with cuts on her neck, told Reuters. "There was smoke everywhere." The Air Force plane was bound for the Gulf port of Bandar Abbas. It was taking 68 local journalists to cover military exercises. Military personnel were also aboard. Minutes after take off the pilot reported engine trouble and requested an emergency landing at Tehran's Mehrabad airport, but crashed just short of the runway, police said. Iranian journalists at the scene wept and consoled one another over their colleagues' deaths. An Interior Ministry spokesman said some of those killed on the ground had been in their cars, whose burned-out shells littered the crash site. The front of the plane was destroyed on impact. A propeller and ripped wing smoldered in front of the blackened building. Flames licked out of the windows of the apartments and thick black smoke billowed into the sky. "Some people were throwing themselves out of windows to escape the flames. I saw two die like that," a policeman said. Passerby Hassan Hedayati, his face covered in dust and hands caked with dried blood, was among the first on the scene. "I pulled 30 bodies out of the plane. They were all charred," he said. The apartment block, which was still standing, is in the Shahrak-e Towhid neighborhood, a residential area reserved for military families. It lies on the flightpath to the airport. Iran has a poor airline safety record following a string of air disasters in the past 30 years although most have involved Russian-made aircraft. In Iran's last major military air disaster, an Iranian Ilyushin-76 troop carrier crashed in the southeast of the country on February 19, 2003, killing all 276 Revolutionary Guard soldiers and crew aboard. Looks like they need a lot of stone to survive.